Yeah I don't get it either. The last review of the 6990 was fantastic with how it was color-coded. Now you have a DIRECT competitor in both price and performance and the 6990 is never highlighted in the charts!?!? It made it a real PITA to always go hunting for the 6990 bars when they should have been labeled from the get-go. "After talking to several other reviewers, this does not seem to be an isolated case, and many of them have killed their cards with similar testing, which is far from being an extreme test." "I most strongly advise anyone to stay away from overclocking this product and use extremely conservative settings, maybe up to 650 MHz and no voltage adjustments." Looks like it is no OC champ. 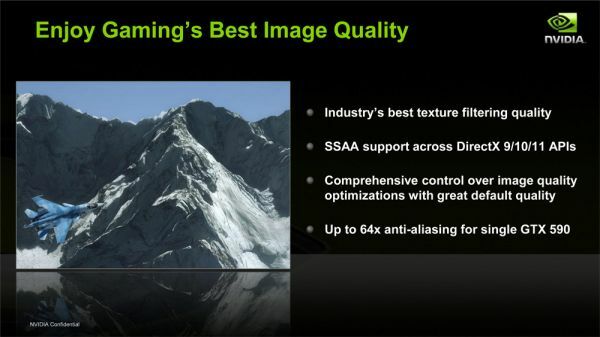 "We truly thought the GTX 590 was going to make the Radeon 6990 look bad, but the fact of the matter is that NVIDIA made the 6990 look that much better. The GTX 590 is not the "World's Fastest Single Card Solution" as stated on our page 1 slides; the Radeon HD 6990 is very much retaining that title. Hail to the King, baby! " ?? Fanboy? NVidia just released their highest end($700) card with a driver that fries it if you overvolt. Me commenting on that, how come that is fanboyism? It is nothing short of a disaster. Sweclockers fried 2(two) Gtx590's. Thats $1400 worth of hardware. TPU fried one. "fries it if you overvolt." Yup. But who doesn't expect voltage tuning today? Read the back of the ASUS box: "50% faster with voltage tuning." Nice way to say: This card can't be oc'ed. It will catch fire. But of course, you are overvolting so it is your own fault. But, only reason I posted it was to warn ppl who invest $700 in a card and has it fry on them. I'm not arguing who shall take blame.